The Party Brands Wine Tumbler Black/Red 2 Pack is a wine lover's dream come true. 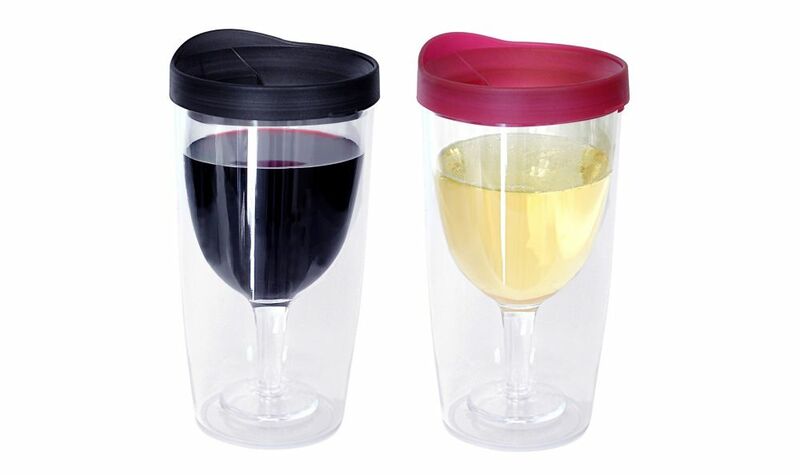 Our wine "Sippy Cup" has a traditional wine glass shape including base in a spill resistant double wall tumbler, so you can sip your wine in style without worrying about spilling. The insulating wall and lid design keeps your wine cooler over a longer period, keeps unwanted dirt and bugs out of your beverage and the colour coded lid is an easy reminder for which glass belongs to you !!! The Party Brands Wine Tumbler is perfect for the cottage, beach, park, tailgating, or any other casual entertaining event. This 2 Pack contains one tumbler with a Black lid and one tumbler with a Red lid. Keep your drink hot for up to 12 hours or cold for up to 24 hours in this 30oz Stainless Steel Double Wall Vacuum Insulated Tumbler by Green Canteen. The materials used to manufacture all Green Canteen products are 100% recyclable and BPA Free. The timeless appeal of Archer accessories works beautifully with an array of bathroom styles. This glass tumbler is designed to fit Archer wall-mount metal holders, creating a convenient and stylish bathroom accessory. Loure offers thoughtful and versatile accessories that coordinate with a wide range of contemporary faucets and interiors. This glass tumbler's unique square shape and frosted finish lend a modern touch to your bath or powder room. Wine Tumbler Black/Red 2 Pack The Party Brands Wine Tumbler Black/Red 2 Pack is a wine lover's dream come true. Our wine "Sippy Cup" has a traditional wine glass shape including base in a spill resistant double wall tumbler, so you can sip your wine in style without worrying about spilling. The insulating wall and lid design keeps your wine cooler over a longer period, keeps unwanted dirt and bugs out of your beverage and the colour coded lid is an easy reminder for which glass belongs to you !!! The Party Brands Wine Tumbler is perfect for the cottage, beach, park, tailgating, or any other casual entertaining event. This 2 Pack contains one tumbler with a Black lid and one tumbler with a Red lid.